Today Leonard Nimoy died. He was 83 and had been ill, so it wasn't a surprise but still a stab in the heart. I thought about writing about how much his work meant to me--and of course by "his work" I don't mean the hundreds of roles he played over his six-decade career but only one of them. Then I realized I already did it. In 2006, the San Diego Comic-Con celebrated the 40th anniversary of "Star Trek" by inviting essays on the subject for its souvenir book. I wrote one and they printed it. It's all still true except for the part about me being 45 years old. I am 45 years old: old enough to claim Star Trek: The Original Series (TOS) cred. I was there when Earth’s molten crust cooled, simple molecules linked to form complex proteins, and my family bought its first color television in time for me to feel the electric primary colors of “Star Trek” burn from ember-orange vacuum tubes through my retinas into my brain. After 40 years, the thematic depth of the McCoy-Spock-Kirk trio has been well plumbed and hardly bears repeating. McCoy is emotion, Spock is reason, and Kirk is the balance between emotion and reason that draws on both to inform decisive action. Id, ego, superego. However, as I age, I’ve been surprised to find I gain new appreciation for these three characters as my understanding of them evolves. Their velour-bloused TOS incarnations haven’t changed since 1969. But I have. When I was a child and teen, Leonard Nimoy's Spock was It: the apotheosis of alienated intelligence. His tools were logic, quiet confidence, and bone-dry wit. He defeated his enemies with brainpower. His weapons were numbers and words. Yet beneath that cool facade roiled overpowering emotions and superhuman strength barely contained. On the rare occasions Spock lost control, the results were unpredictable and frightening. 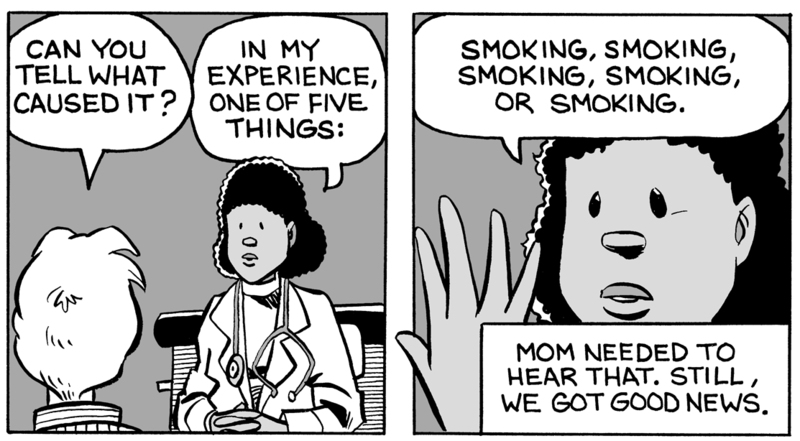 Adolescence never had a better metaphor. Spock was important to me. He valued things I valued—reason, science, knowledge—and wasn’t embarrassed by it. I had a temper as a child; watching Spock struggle to maintain his self-control helped me tame it. He taught me grace under pressure. When a junior high bully twice my size picked me up and threatened to drench me under an overflowing rainspout, I replied with cold Nimoyan indifference, “I would actually prefer it if you didn’t,” and he released me with a laugh and enough respect to never bother me again. Being cool worked. Spock was about restraint, temperance, placid courage, and the triumph of the intellect. He guided me through many rough passages as I matured, and got me safely to the other side. Where I was met by James T. Kirk. It’s always been easy to mock the flamboyant Kirk, yet I believe—in all sincerity and without a trace of condescending sarcasm—that Captain Kirk is one of the great characters of twentieth-century American fiction. Kirk was twentieth-century America, or at least the best of how twentieth-century America saw itself: bold, confident, powerful, ambitious, thoughtful, resourceful, loyal, compassionate. Had a twinkle in his eye. Did all right with the ladies. Always found a way to win. Shatner made him that. For the past couple of decades, Kirk has gotten a bad rap as a trigger-happy gunslinger. Slander! Not this man who agonized over decisions that sent crewmen to their deaths. Who knew Shakespeare and quoted Masefield. Who once had a Gorn by the throat (felled by a cannon Kirk fashioned from dirt and twigs, and I’d like to see you try it) and showed the impressively advanced trait of mercy. Spock may have been superhumanly smart and strong but, like an adolescent, he wasn’t comfortable in his own skin. Kirk knew who he was, what he was doing, and why he was doing it. He was a man. Of course, part of being a man is that you quit looking to fictional role models to show you how to be one. Unlike Spock in my youth, I can’t pinpoint aspects of my adult life consciously patterned after Kirk, unless you count his purposeful stride as he leaves the Enterprise’s chapel headed for the bridge at the end of “Balance of Terror.” Sometimes I walk like that. I like to think I’ve internalized some of his courage and cleverness, but until I actually have to face down a rock-melting Horta or drive a computer mad with illogic, how would I know? Nevertheless, if anyone had asked me between the ages of 20 and 40 to name the best character in the “Star Trek” canon, I would have said Kirk. Perhaps I still would. But when I watch TOS lately I find myself powerfully drawn to Leonard McCoy and the understated performance of DeForest Kelley. I never cared for Bones when I was younger. He was a few years older than Kirk and a few watts dimmer than Spock. Distrustful of technology and contemptuous of trivial rules. Cranky. Jaded. Jowly. Maybe a little weary. Maybe I’m beginning to relate. McCoy trusted the ship to Kirk and Spock while he calmly commanded Sickbay, comfortable in his mastery, as much a man of science in his element as Spock was in his. If you needed someone to brew a telekinesis serum or reinstall a brain, there was no one better in the galaxy. He faced down a scalpel-wielding Khan and, in my favorite McCoy moment, knocked out Kirk and Spock to take their places in an alien torture chamber. McCoy had paid his dues and didn’t have anything to prove to anyone. Despite his occasional bluster, he was probably the most laid-back person on the ship. Until recently, I might not have recognized the quiet heroism of a mature adult who could be counted on to keep his cool and do the right thing. By now I’ve seen enough of the opposite in the real world to treasure those qualities wherever I find them. TOS was a sophisticated program for sophisticated viewers, and even before I finish typing this sentence I imagine scoffers pointing to its sometimes laughable effects and props, day-glo sets and costumes, outdated sexism, and overwrought melodramas with ham-handed morals. On the other hand, audiences in the 1960s didn’t need to have everything spelled out for them. They understood the art of allegory in ways that seem to escape modern viewers. TOS charmers like “A Piece of the Action” or “Bread and Circuses” would be impossible in later decades because more modern audiences, blinded by literalism, know for a fact that when we eventually travel the galaxy we will not find strange new worlds populated by Chicago gangsters or twentieth-century Romans. Guess what: we won’t find pointy-eared Vulcans or blue-skinned Andorians, either. Guess what again: people knew that in the '60s, too. Nor would modern audiences accept such highly stylized episodes as “The Empath” or “Spectre of the Gun” that deliberately screamed out, “This is a make-believe story filmed on a soundstage for your entertainment!” Today we applaud ourselves for seeing the mirrors and wires that sustain the illusion, not realizing that perhaps the greater skill lies in ignoring them. We’re not holding up our end of the artist-audience bargain. TOS was a smart, stylish program of its time. The fact that many viewers and fans moved on to newer, flashier, darker, or grittier Trek incarnations that abandoned metaphor and humor, and felt compelled to actually explain why everyone in the galaxy spoke English and looked like an L.A. starlet, reflects worse on them than on the original “Star Trek.” If you’d rather watch an hour explaining how Klingons got bumpy foreheads than exploring why a half-black half-white man hates a half-white half-black man, I won’t argue. Everyone’s entitled to their taste and opinion. We can both call ourselves “Star Trek” fans, even if it turns out we don’t have all that much to talk about. But you may be surprised to discover which Treks grow on you—and with you—in the long run. "Wait a second, I know her!" And here's what she looked like 10 years ago when I drew her in Mom's Cancer. What, you thought I made those people up? One of my mother's physicians is still out there getting it done. She's a great doc and I think that's terrific. Weird to just have her pop up on my TV screen, though. I'm spending some time this weekend developing a new hand-lettered font for upcoming comics projects. I'm happy with how it's turning out and wanted to show it off. I've talked about lettering before, explaining how I hand-lettered all the pages of Mom's Cancer directly on the original art, the way God intended, but learned that it made it very difficult to edit and prepare foreign-language editions (which is a nice problem to have). For Whatever Happened to the World of Tomorrow I sampled letters from Mom's Cancer and used them to build a computer font using a program called Font Creator. 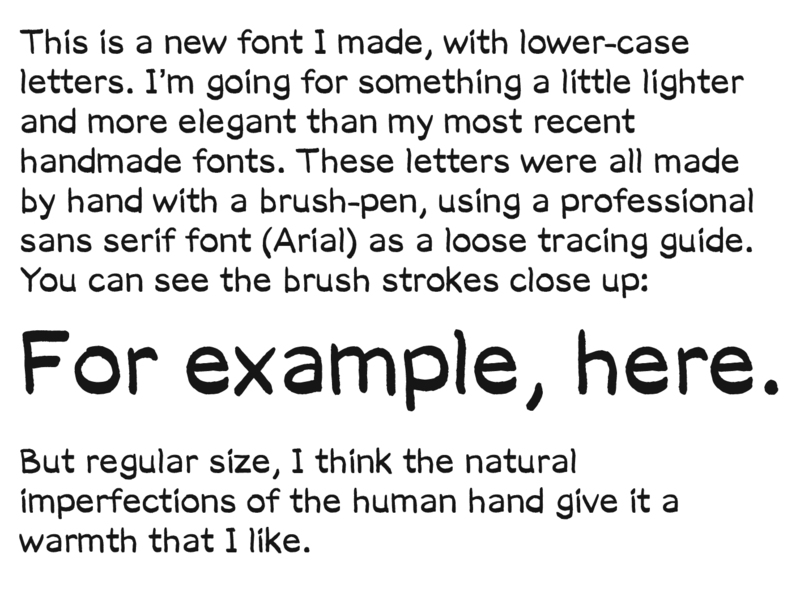 Now, there are websites that'll turn your handwriting into a computer font for free--you just print your letters on a template, upload it to them, and download your font a minute later--and I initially tried one of them. The quality wasn't good enough. A lot goes into making a real font, including how the letters are spaced (kerning, leading) and all work together. I needed more horsepower, and Font Creator had it. So for the past several years I've used a computer font I created based on my original hand lettering, and it works swell. There are some trade-offs, including a loss of hand-crafted authenticity that I regret, but the benefits are just too great. Editing is a snap; I can change or delete text without having to redraw an entire page. When it comes time for non-English editions, I simply delete all the text (if you know Photoshop, it's on its own layer) and send them wordless files. There's no going back to the old ways for me. However, traditional comic book lettering, including mine, is all upper-case capital letters. Now I need lower case, partly because some projects I'm working on will be text-heavy and it's hard to read paragraphs of upper-case narrative. IT LOOKS LIKE SOMEBODY'S SHOUTING AT YOU ALL THE TIME! I still wanted a font that looked handcrafted and was legitimately mine, but easier on the eyes. It needs some tweaking but I'm pretty pleased with it. Hope you get to see it in something soon. I recently read a piece online about a young graphic novelist whose book, according to the article, "is being made into a movie." The excited creator talked about the screenwriting process and casting decisions--which stars they imagined playing which roles--and it went on like that for a while until deep in the article, when we learn that the creator's big break had been getting their story optioned. An option means that you give a movie or TV studio the right to develop a film or show based on your work for some length of time, maybe a couple of years. Ideally they pay you some money for it, but it's not a deal or a commitment. It's just your promise not to sell your idea to anybody else while they think about it. I probably know a dozen writers, cartoonists and graphic novelists who've had their stories optioned (and I hardly know anybody). Fewer than one in a hundred will ever get made. One friend has had the same project optioned by three different movie studios in succession, with nothing to show for it. Another friend had Will Smith sniffing around his comic because Smith wanted something for one of his kids to star in, until the kid got too old to play the character. An option sounds real neat but, from what I've seen, at a certain level in the business it's kind of routine and usually disappointing. So going to the press super-excited about your option is a little embarrassing. Understandable--who wouldn't start drafting their Oscars speech?--but embarrassing. Jeff is the exception that proves another rule of getting your stuff made into a movie, which is that creators are often disappointed to discover they have no say in what happens to their creation and are unlikely to become rich and famous. Ninety-nine percent of the time, a studio buys the rights for a relatively modest sum, hires its own writers, and cuts the creator out of the picture. If you want your movie to get made, that's the deal you sign. I'm always surprised by how many creators say they're OK with that. But Jeff is in the 1% who insisted on significant participation in the filmmaking and got it. He's credited as a producer and spends a lot of time hands-on on set. He had the leverage to say "my way or the highway"; not many other people do. I am not at "a certain level in the business," just a kid with my nose pressed against the glass. Several years ago an independent movie producer contacted me about optioning Mom's Cancer. He was a real nice guy but had no money to offer, and as we talked I didn't get a feeling he really knew what to do with the story. Also, at the time, Mom's Cancer was getting some press, and Kid Sis had her own circle of independent filmmaking friends in Hollywood whom we thought might be interested. So because I wanted to leave my options (heh!) open and not tie up the rights with no benefit to me, I declined. And that was my only nibble. The year Whatever Happened to the World of Tomorrow was nominated for some awards, a scout for 20th Century Fox e-mailed and asked to meet with me at the San Diego Comic-Con. Here's one thing you may not know about me: I am the world's worst negotiator. I replied along the lines of, "Geez, I don't see why you'd be interested, it barely has a plot." Nevertheless, we had our meeting, and the scout was so excited he got me excited. I began to see the movie in my head. I still couldn't imagine how anyone could film my book, but I could envision a movie-about-being-a-movie in the same way WHTTWOT was a comic-about-being-a-comic. Sort of a meta-movie about Space Age history with scenes featuring my Cap Crater character done in the styles of science fiction directors like Fritz Lang, George Pal and Stanley Kubrick. It would be brilliant! In the back of my head, I started working on my Oscars speech. A couple of weeks later, the scout sent me a brief e-mail. Fox was going to pass because, it turned out, my book barely had a plot. As I've matured in the comics world, I've learned the importance of keeping a level head. Don't be crushed by the lows, don't get too elated by the highs. Some things that seem like big opportunities aren't, and other things that seem like small potatoes turn into something good. Best just to roll with it, say "yes" to a lot, and see what happens. Still. It hardly ever hurts to dream. 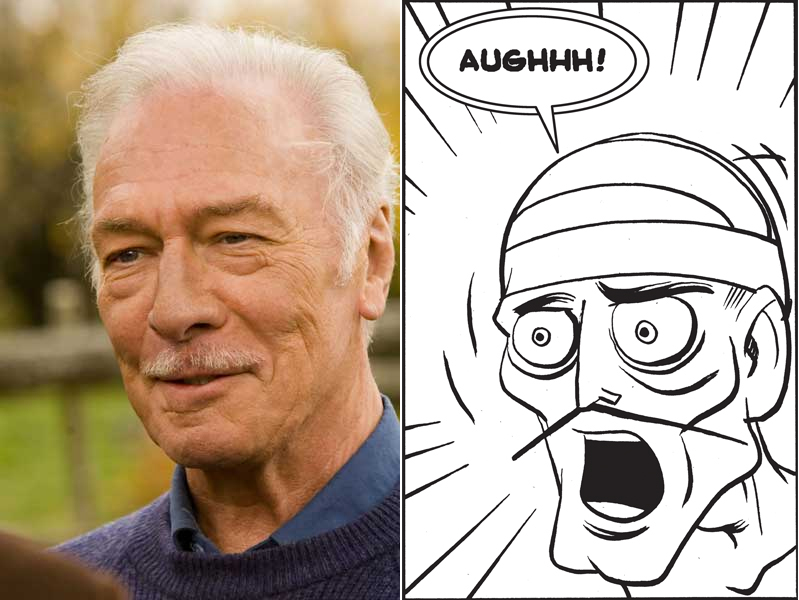 In a world where Christopher Plummer IS Sparky the Inventor, my Oscars speech is ready.